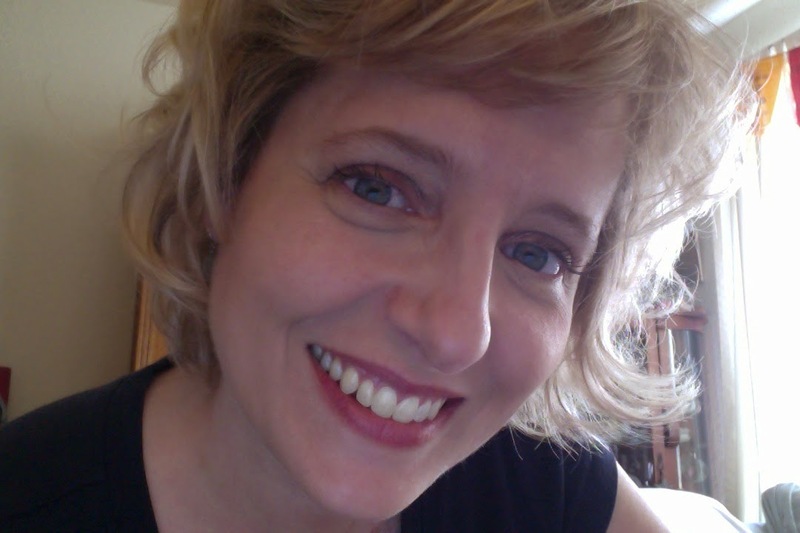 Doresa and I met through our involvement with GHF: Gifted Homeschoolers Forum. In fact, I cited some of her work on the topic of gifted minority students in my second book, Gifted, Bullied, Resilient: A Brief Guide for Smart Families. This post is part of a series. I work full time as a Senior Faculty member for a university. I’m also an adjunct for two other universities, and I teach exclusively online. I work a minimum of 40 hours per week, but it is not unusual for me to work 50 hours per week. We chose to homeschool for a number of reasons. The primary reason was because all three children are gifted as well as dyslexic. We started in 2010, and we live in a district where dyslexia was not considered a learning disability for accommodation until the 2015 school year. Also, in our state, a child does not quality for services unless they work significantly below grade level. Due to our children being gifted, they rarely work below grade level, although their dyslexia is severe. They still needed both remediation and accommodation, but would not have been granted those things in our local school system. There were not private schools in our area that could accommodate their needs either, so--here we are! I have a set of twins that are in the 5th grade this school year as well as a 7th grader. Yes, all three are homeschooled. The biggest challenge is honestly getting other people to understand that working from home is still working. When I am working, I am doing things like evaluating Master's level thesis for students pursuing a graduate degree in Education or reviewing presentations for Speech Communication courses. While it might 'look' like I am just at home in my office, I am fully engaged in the work I am doing. Another challenge is feeling a little out of place. Some of my friends who work outside of the home lament or celebrate time away from their kids; I can't relate. Even though I work full time, I am also home with my kids and interacting with them for most of the day. Meanwhile, my friends that homeschool may talk about having to give up their career or talk about the joys of getting to sleep a bit later. My career is still moving forward and going strong, but my sleeping late? Absolutely not. I start my work day around 3:30 A.M. every morning, seven days a week. The delights of working are that I am happy that I got to keep 'my' identity. Although I went into a different field full time when I started homeschooling, I still have a thriving career. I am contributing to my retirement account. I earn sick days and vacation days and make a fair salary. While I enjoy being a wife and mother, I also enjoy being "Dr. Jennings" and having that as a part of my identity as well. The best piece of advice I got was right when we started homeschooling. It was from a homeschool mom who had recently graduated her last child and they entered college with a full-ride, merit-based scholarship. She said colleges wanted to know one thing: what had the student done with their gift of time. That was so powerful to me. One advantage of homeschooling is time--and freedom--to make interesting choices and explore unique avenues. I have tried to keep that in the forefront of my mind. Being homeschooled is a unique experience, so what are my kids having an opportunity to do that they wouldn't be getting in a traditional school environment? I love finding resources! I enjoy mixing and matching, but have found the best 'nuggets' by scouring government and organizational websites. Look for "education" or "outreach' resources. There are a ton of high quality, free resources to be found this way. The biggest pieces of advice I would say is that it can be done. Just make sure you are choosing avenues that work for you and your family. You do sometimes have to make sacrifices; I sacrifice additional sleep by getting up early. But, working while homeschooling is doable. The other thing is to make sure you are doing cost benefit analysis when it comes to your time. Take opportunities only if they will allow you to continue to homeschool in the way you want (and that your children need). These choices will be different for each family. If I wasn't allowed to set my own schedule, my current positions would not be a good fit. However, that is what works for my family. Also, I want to be honest that it can feel lonely at times. You don't quite fit with your working friends that don't homeschool and don't quite fit with your homeschooling friends that don't work. That is okay. You will find your tribe in due season. 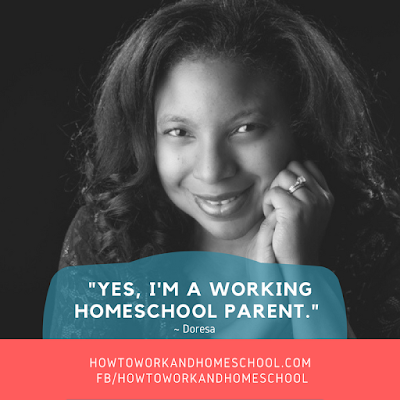 Last piece of advice: If you can make working while homeschooling fit your family--do it. I think working makes me a much better homeschooling parent. Since time is valuable, we don't get caught up with trends or fads. My kids work independently when needed, and I am forced to think strategically about what we do and commit to. I think all of these things have had great benefit for my children and their education. Plus, when it is time to end our homeschooling journey--either when they have all graduated or we feel another option is a better fit--I won't feel like I am starting over professionally. I am on my own journey just like they are on their own journey. Thank you, Doresa! 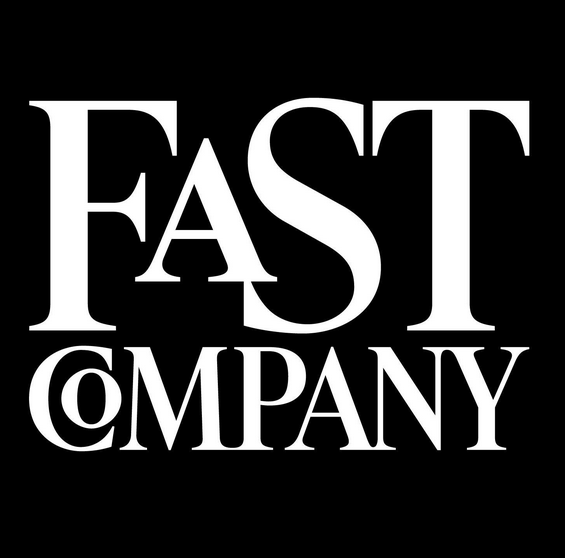 Such great advice and insights offered here. Readers, you can find and follow Doresa on YouTube and Twitter: @DAJedu1. I've got an excerpt from my book on bullying that includes comments from Doresa on challenges facing gifted children of color. You can read it here, on my main blog. 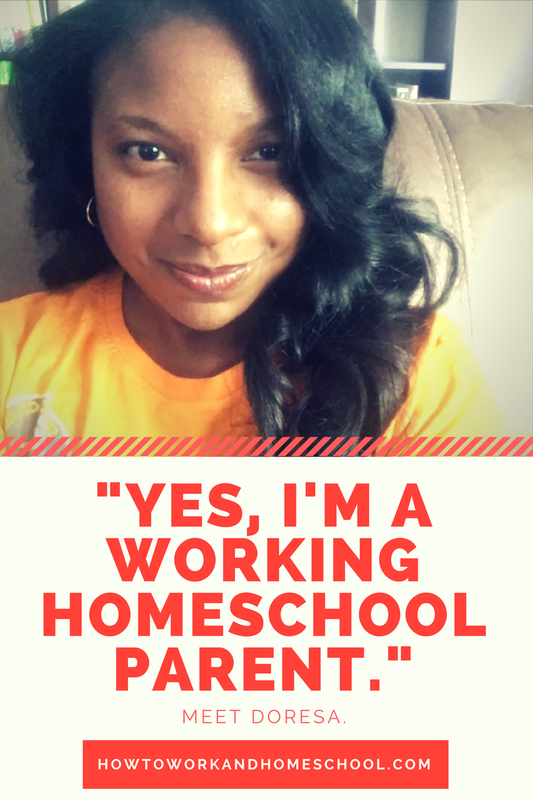 Doresa, you did a beautiful job of addressing the unique place of working full time while homeschooling. It is a unique challenge and gift, and I am glad to know you and have your wisdom and influence for my family.